DigitalGlobe, in Partnership with Ecopia, Debuts the First Precision, GIS-Ready Building Footprints of Entire U.S.
DigitalGlobe, a Maxar Technologies company (NYSE:MAXR) (TSX:MAXR), has produced the first precision, GIS-ready building footprints dataset of the entire United States in partnership with Ecopia Tech Corporation ("Ecopia.ai"). Ecopia U.S. Building Footprints — powered by DigitalGlobe — is available for order immediately and includes more than 169 million building footprints created by proprietary artificial intelligence algorithms in combination with DigitalGlobe's high-resolution, high-accuracy satellite imagery. 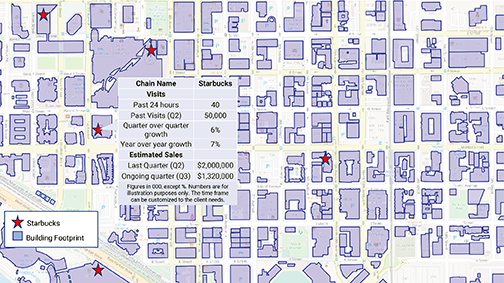 The detailed dataset helps customers save time and money by knowing exactly what the built environment looks like in their area of interest, allowing them to make decisions with confidence. Ecopia's Enhanced Geocoded Footprints start a foundation of industry-leading building footprints, generated from aerial imagery and then updated with satellite imagery. This approach allows us to leverage both the positional accuracy of aerial imagery and the updating frequency of satellite imagery. These footprints offer 100 percent coverage of the USA, are guaranteed 95 percent accuracy, and updated every year using the latest satellite imagery available on the market. Ecopia U.S. Building Footprints is a semi-automated solution produced with a speed, consistency and scale that no other commercial or open data product on the market can match. The 2D vector polygon dataset has a greater than 95% accuracy rating, a uniquely high percentage in the industry, and will be refreshed every six months based on new DigitalGlobe imagery received through the company's Geospatial Big Data platform (GBDX), ensuring the most current foundational information is available to inform customer decisions on projects like mapping, insurance risk assessment, disaster management and land administration. Natural gas pipeline operators are federally required to annually locate, count and classify every building within a specific distance of their pipeline. One of the largest pipeline operators in the U.S. streamlined a traditionally manual and time-consuming workflow for locating and digitizing building footprints by using more than 700,000 building footprints, which were produced in a matter of days instead of the traditional months-long timeframe. One of the largest global development organizations commissioned DigitalGlobe and Ecopia.ai to use their innovative process to create building footprints for the entire country of Tanzania for use in settlement mapping analysis because a current map did not exist for much of this country . The partnership created 18 million building footprints in three weeks, supporting public health campaigns, sustainability initiatives, and risk reduction. DigitalGlobe and Ecopia.ai will extract building footprints for major international locations by the beginning of 2019. Additionally, the partnership is ready to produce building footprints anywhere in the world based on customer request. To learn more, please visit our website. Bill Singleton, Ecopia Tech Corporation VP, said that the combination of Ecopia.ai's algorithms and DigitalGlobe's high-resolution satellite imagery accessed through GBDX creates reliable, game-changing solutions for many industries. Ecopia U.S. Building Footprints puts readily available data in customers' hands to make timely business decisions and eliminates the need for manual, slow and expensive on-the-ground surveys and this product has the potential to transform many applications, such as reducing the time between census data collection from once per decade to once per year for civil governments. 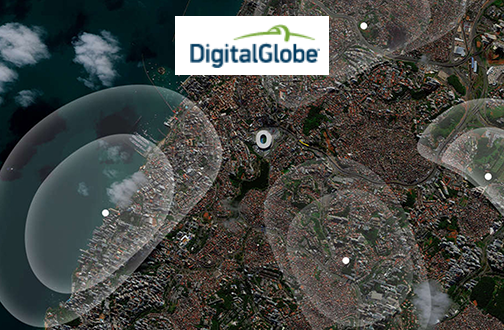 Amy Minnick, DigitalGlobe SVP and GM of Commercial, added that DigitalGlobe is proud to offer a product of unmatched quality, accuracy and completeness that is quickly produced and easy to access. The firm sees great potential for Ecopia Building Footprints to be used as a foundational data source in a wide variety of commercial and global development applications. Creating high-quality building footprints with Ecopia.ai will help Build A Better World.